The Nester's Name — Ginger writes. It was really bugging me not to know how to pronounce Myquillan's name. Myquillan, the blogger known as "The Nester." Myquillan, the lady who wrote The Nesting Place. I finally Googled "how to pronounce Myquillan Smith's name." And now I know it's Jacqueline, but with a Mike instead of a Jack. I read on The Nester herself's blog that she doesn't really like her name, there's no special meaning behind it, and it's a name her mom made up. If you've known me for any time at all, it's likely you'll know I have a thing for names. I don't know why. But I care immensely about what your name is and how it's spelled. TJ has learned not to come home and tell me a story about someone he met on a work trip or at a business lunch or even at a social event, and how many kids this person has unless he can also tell me those kids' names. Before I knew I was done having kids, I probably would have said my motivation for knowing names was that I might find my next good name for a kid that way. I found Sailor's name in People magazine, and were it not for that little blurb on Christie Brinkley's teenage daughter Sailor that I "happened" to read while walking on the treadmill, I might not have four kids at all. That name spoke to me, just as Bauer, Cash, and Story's names did. One more name still speaks, out of the wild places of my heart. But the case is closed (or as closed as is possible in a world where I'm not in control) on having more kids. So what to do? I told my friend Cat in a letter last July that I had found a new name to love: Minnie. I also like Winnie, Ramona, and Betty. 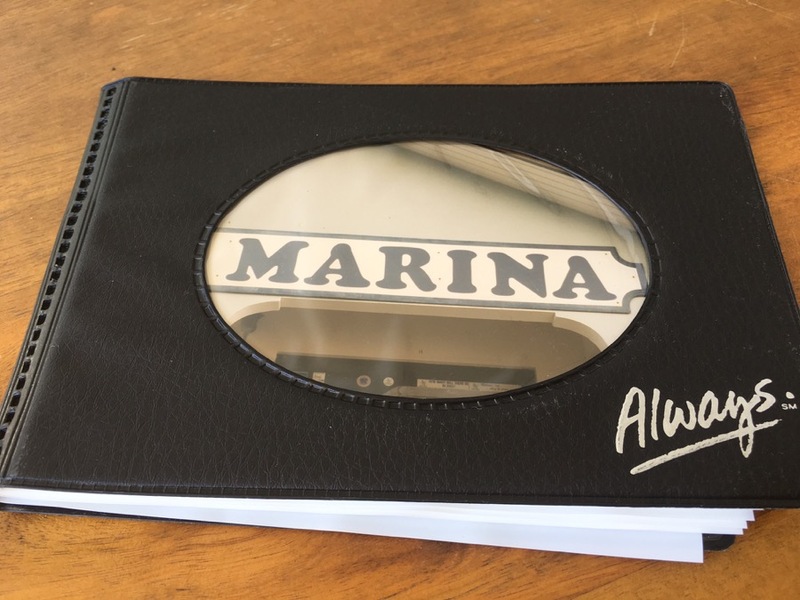 Marina, though, is my favorite girl name I didn't use. 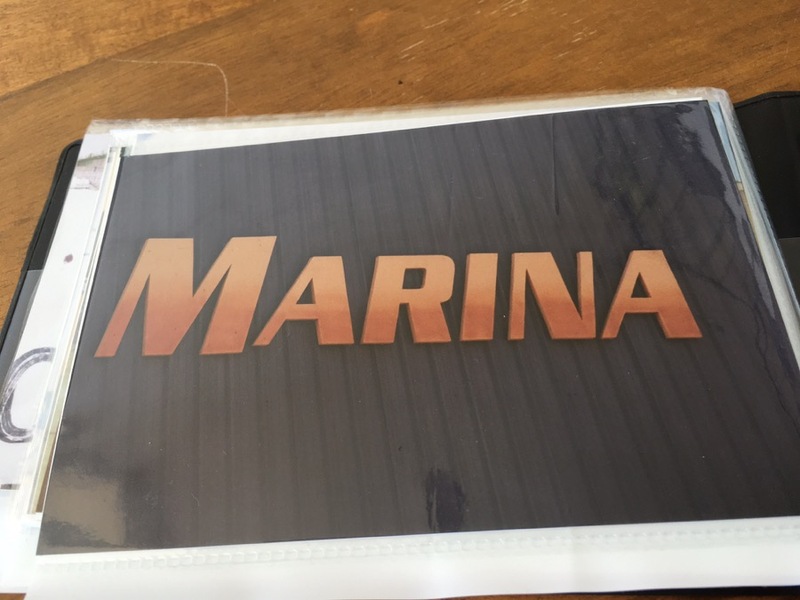 When I was in high school and college, I used to take pictures of the word Marina whenever I would see it on a sign. 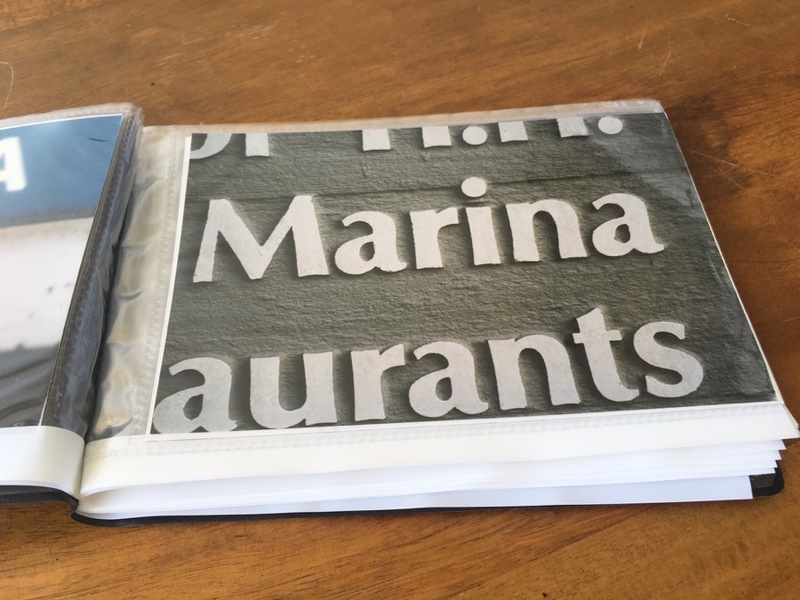 (And I would go out of my way to find Marina signs.) This was back when you took pictures with a real camera and had them printed at Walmart. 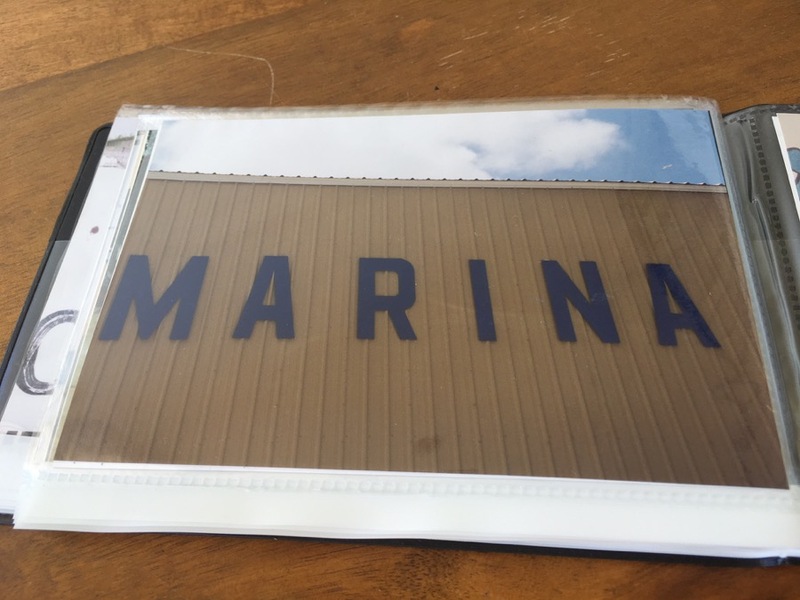 I put my Marina pictures in a cheap little Walmart album, and I kept it. Always. But how in the world did I have two girls and not name one of them Marina? Sailor Marina may have been a bit much. I made a list of boy names in a letter to my sister Holly last July also. At the time she was pregnant with my nephew Wade. She hadn't picked Wade's name yet, so I was always thinking, listing, sharing. My name love at the time was for Roger, Ernie, Linus, Dayton, Monty, Gunnar, Gus, Keane, James, Truman, Desmond, Bo, and Wilder. I told Holly that the last three names on the list are ones TJ and I would have seriously considered for another boy. Can you guess my favorite, the name that I referenced above as being the name that still speaks? TJ and I have not ever seriously considered adoption, but if God were to somehow place a Marina or a Wilder in our path (and God can do anything, you know), we would recognize the sign and know those are Friesen kids. There are no accidents. God sees and knows each of us by name. That our parents got to name us, and that we get to name our children, is one of the greatest privileges in all of life, in my opinion. To have the power of naming a child, saying the word that they will most identify with for the rest of their lives, is as God-like as I can imagine. And yet, we also get to be in the renaming business. God knows our names, yet God speaks beyond our names. You are not Fearful. You are Brave. You are not Anxious. You are Calm. You are not Despairing. You are Hopeful. You are not Demanding. You are Depending. You are not Broken. You are Whole. There is a world of renaming to be done, both in our own lives by the God who loves us, and in how we relate to the Bauers, Cashs, Storys, and Sailors that we named at birth. We help write each other's stories as we speak names that are good, beautiful, and true to all those around us. Our names are more than our names. They represent our essences, our similarities, our differences, our places as children, and always our home in the heart of our Father and Mother God. Thank You, God, for making me with so much name love in my heart. Older PostMonday Minutiae: What's Tandem?